This distinguished gentleman is Mike Myers, known as the Spitalfields Crooner, whom I wrote about earlier this year. You may recall that I republished his 1986 pub profile of The Golden Heart from “Spitalfields News”, which Mike edited during the nineteen eighties. 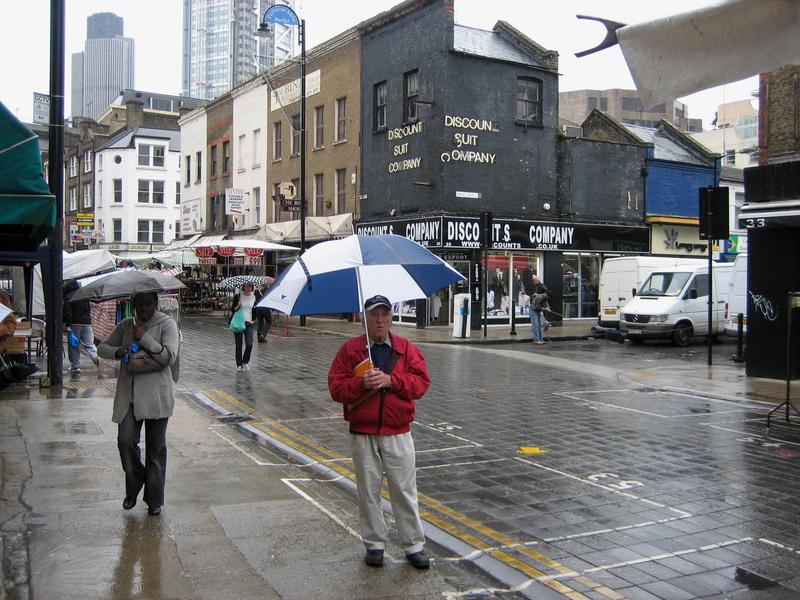 Last week, Mike and I took a walk together through Spitalfields. Undaunted by the cold weather, he was waiting for me eagerly, sheltering from the rain under the market canopy – just outside the front door that leads to his flat above the shops in the old market building. In spite of the dismay weather, Mike looked cheery with his colourful golfing umbrella in one hand and his file of photos in the other. We were going to undertake an epic journey through time and emotion to the other side of Spitalfields, where Mike grew up in the nineteen thirties. For Mike, Spitalfields is a rich mythical landscape of the imagination filled with colourful images and legendary characters from his long life in these streets surrounding Christ Church. “We enjoyed the radio at home, but the cinema was the place to go out for entertainment,” continued Mike with enthusiasm, introducing the opening of the Mayfair Cinema in Brick Lane in 1936 where he saw William Powell in “Escapade” in the first week. Thanks to the presence of the Mayfair Cinema, now long gone, Mike became a film buff and was the only one in the audience when Laurence Olivier’s “Henry V” and “Hamlet” were shown, years later. Looking West towards the City of London, Mike indicated the street where he had one of his first jobs, “During the war, I was working across the road, loading dresses into a van and the next thing I knew I was on the floor of the van, because a V2 rocket had dropped just round the corner.”, he revealed, still grateful for his lucky escape. In 1974, when Brunswick Buildings was compulsorily purchased and demolished by the GLC, Mike was moved to the flat in the 1886 Horner Building where he still lives today, in rooms adorned with movie posters and lined with shelves of DVDs. When we arrived back from our short sentimental journey of less than a mile, I was curious to learn more. 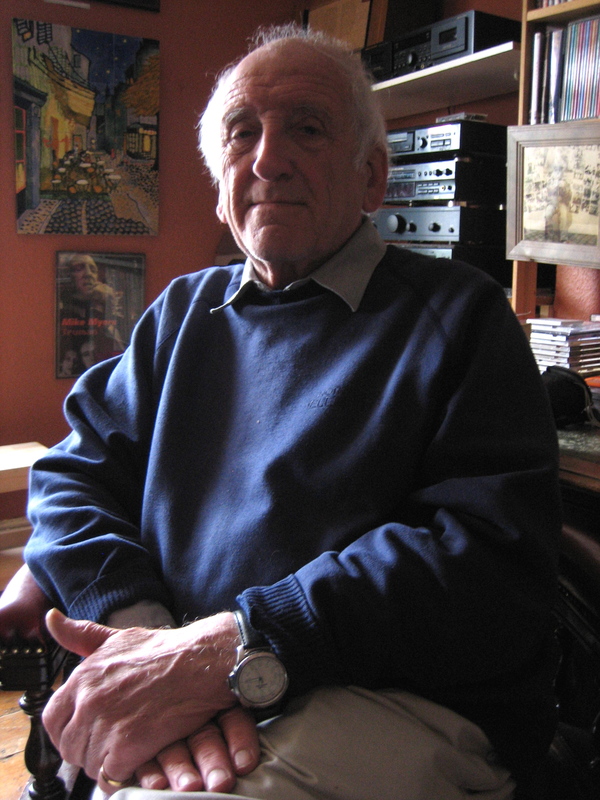 But I had to content myself, for now, with photographing Mike there in his home above the Spitalfields Market, his point of arrival, surrounded by the evidence of his passion for cinema that began at the Mayfair Cinema in 1936. Witnessing the changes in Spitalfields over a lifetime has given Mike a generous philosophical outlook and you will see him most days in the streets about the market, a benign presence – commonly absorbed in thought, yet ever curious about the life of the street – humming show tunes to himself, expressive of his characteristic levity and lightness of touch which have carried him through life with such grace. As part of the Spitalfields Festival, Mike Myers has recorded an audiotour, enabling you to hear more of his stories of the neighbourhood and follow in Mike’s footsteps along his life’s journey from one side of Spitalfields to the other. You can download it by clicking here. Brunswick Buildings, New Goulston St, where Mike grew up. 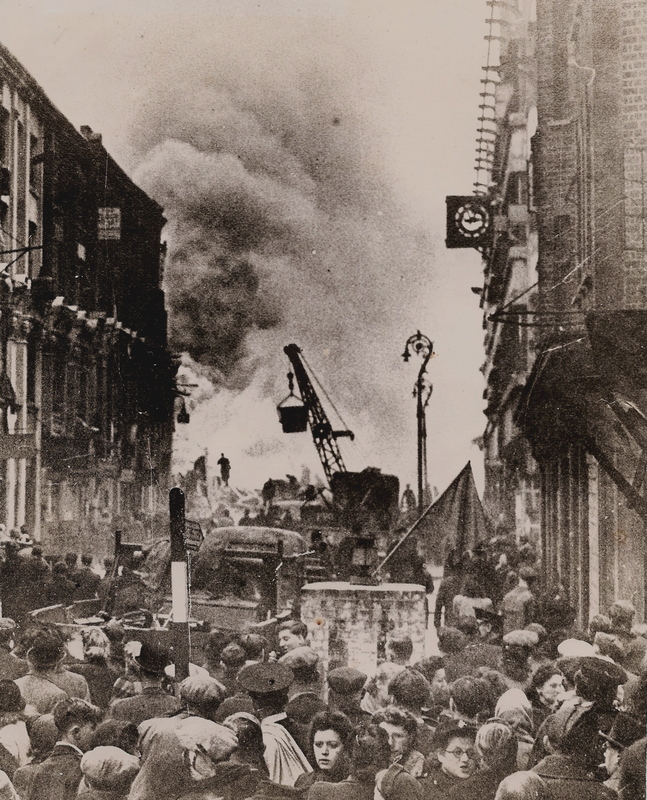 The explosion of the V2 rocket at the top of Middlesex St in 1944 that gave Mike a close call. 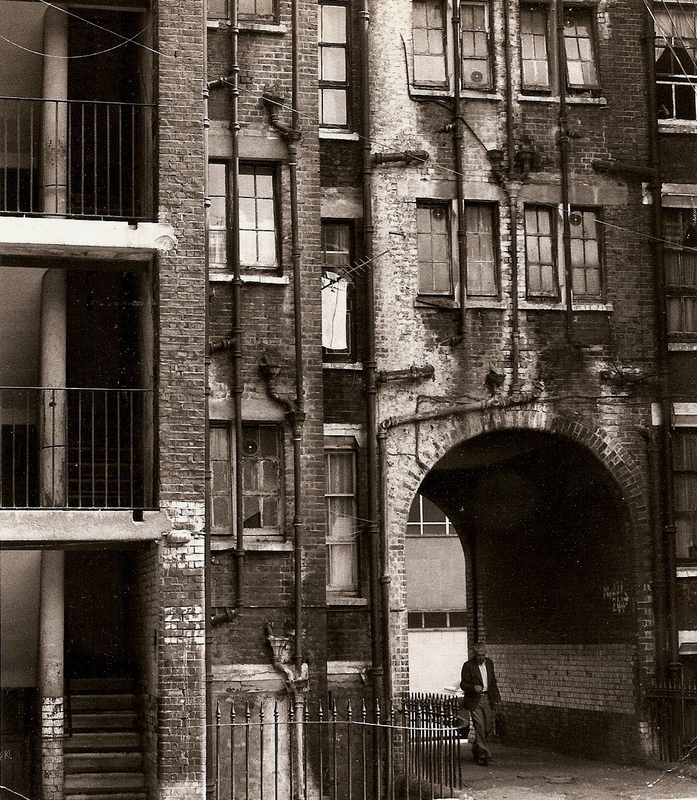 Im looking at the wonderfull pictures and story of Mike Myers, I was born and bred in Stepney ,lived in Great Eastern Bldgs all my life opposite Trumans Brewery.However my father lived in Brunswick Bldgs and was known as the Nightingale of Brunswick Bldgs bacause he had a good singing voice,Sadly hes passed away but I enjoyed the story very much. This is great to see and read about I am also tracing family who lived at 27 Brunswick Building, in 1901 Parents Benjamin and Elizabeth Jacobs and children Sarah and Abraham. Sarah was my Great Nan and I am trying to find out more about her career my Grandfather Benjamin’s birth certificate shows Sarah as a Music Hall Artist by 1913. Anyone reading this who remembers Sarah or the family it would be great to hear more about them.